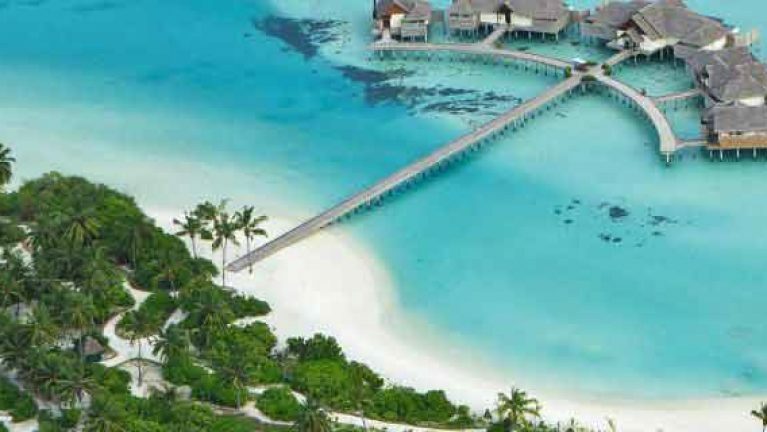 Niyama Maldives Resort across stunning sparkling ocean and blossoming greenery at Dhaalu Atoll. One of the finest luxuries Private Resort. Niyama private Islands Maldives, consists of twin islands Play and Chill, for the finest luxury luxury experience of Maldives..
At Niyama Maldives Resort guests have a selection of two private islands. PLAY and CHILL Island. Play is personalized for honeymooners for romantic, passionate time with partners. While Chill is for friends and family willing to spend relaxing serene moments. The resort hosts villas on land and over water. Each designed to provide guests utmost comfort and intimacy. Each villa has a private deck which offers private pool, Thakuru (butler) and a wonderful rain shower. With 9 dining avenues; over water or on beach. The guests are set for gastronomical paradise. Where taste buds will be enriched with flavors from around the world. Enjoy the first ever under water nightclub or pamper yourself in the spa while at Resort. Spend time watching the beautiful crystal clear lagoons. Or dive underwater to catch up with dolphins and sharks. Kiss the sun with yoga in dawn. Or set out for romantic Dhoni cruise experience. Planning for a romantic honeymoon or some quality gateway with family and friends in The Maldives? Create amazing memories at Niyama Private Islands Maldives. Seaplane transfers are available during day light only (06 Am to 4:30 Pm) daily. Late arrivals will have to stay over night at the Airport hotel or Male' city hotel. Transfers will be arranged following morning. On your arrival to Velena International Airport - Resort representatives will be stand by to welcome you to the resort transfers. Liberate your senses to therapeutic treatments at Lime Spa. A purifying experience enhanced by the relaxing atmosphere of lush vegetation, powdery sand beaches and endless Turquoise Ocean. The spa features 6 over water treatment rooms with lagoon view and 2 treatment sanctuaries with private gardens, outdoor bath, rain shower and daybed. Stay Minimum 3 – 6 Nights & Receive 30% Discount on Room Rates. Valid for 3 - 6 Night stays only. Offer is combinable with Early Bird Offer 2019 & Honeymoon/Anniversary/Birthday/ Repeater benefits as per applicable dates. * Also applicable from: 1st to 31st August 2019 and 1st October to 22nd December 2019. Stay Minimum 03 – 06 Nights or more & Receive 35% Discount on Room Rates. For split stay a minimum of 2 Nights stay in each room type is required. Applicable for 3 Nights or more nights bookings only. Offer is applicable on Room rates only & not other services. * Also applicable for stays during: 01 to 30 September 2019. Book before 31st March 2019 & receive Complimentary upgrade to Half Board for Bookings. Applicable for Bookings confirmed before 31 March 2019 Only. Combinable with all offers - wherever applicable. Breakfast and Dinner buffet dinner (Food) at Epicure or BLU only, US$ 50 net food credit (Inclusive of service charge and TGST) per adult at NEST, Edge and Tribal Only. - Food Credit not applicable for Destination dining, Sub-six, Room service and other special dinners. - Free upgrade to half board is applicable to the additional adult supplement. * Combinable with all offers - wherever applicable. Stay Minimum 7 Nights or more & Receive 40% Discount on Room Rates. Applicable for 7 Nights or more night bookings only. Discount applies to nightly room rates & not on any other services / supplements etc. Stay Minimum 7 Nights or more & Receive 35% Discount on Room Rates. * Also applicable for stays during: 09 January to 7 May 2019 and 1st to 31 August 2019. *Also applicable for stays during: 09 January to 7 May 2019 and 1st to 31 August 2019. Kids Stay & Dine Free! *Up to 2 children below 12 Yrs. of age will be provided Complimentary Accommodation & 3 meals per day from buffet or Children’s menu. Applicable for up to 2 children (below 12 yrs) while sharing with parents. 50% Off will be offered if kids dine from adult's menu. Combinable with all other offers where applicable. * Complimentary Kids menu at all restaurants (only) for Breakfast, Lunch and Dinner. * Accommodation in Beach Villa for 2 Adults for 4 Nights. * Both ways Airport Transfers by Domestic Flight + Speedboat Included. * All Payable Taxes, GST, Green Tax & All Charges + Special offers included. *Book before 31st March 2019 & Receive Free Half Board (Buffet Dinner for whole stay). *Packages are available for shorter or longer stays - please send us an inquiry with your requirements. * Book before 31 March 2019 & Receive Free Half Board! * 06 Nights accommodation in Beach Villa for 2 Adults. * Both ways Airport Transfers by Domestic Flight + Speedboat. * Book before 31 March 2019 & Receive Free Half Board. * 5 Nights Accommodation in Beach Villa for 2 Adults. * All Payable Taxes, GST, Green Tax, & All Charges + Special offers included. * 4 Nights accommodation in Beach Villa for 2 Adults. * Bed & Breakfast (Daily Buffet Breakfast Included). * All Payable Taxes, GST, Green Tax & All Booking Charges + Special offers included. Guests may enjoy a buffet or 3 course lunch set menu at Epicure. Dine Around Credit of USD 70 Per person++ is available for Dinner. Cloistered between blooming greenery of island and soft white sandy beaches, beach villa is a barefoot experience. The villa is spacious and well-furnished with a master bedroom featuring king size bed, open air bathroom with open air rain showers, bathtub, and a private deck leading to the beach. Relax yourself catching the glimpse of mesmerizing sunsets, crystal clear lagoons in your private deck. You can sit in your Dhoni shaped swing and watch the beautiful oceans making its own music. Minibar, Shower, Bath, Safety Deposit Box, TV, Telephone, Air conditioning, Hairdryer, Iron, Balcony, Bathrobe, Desk, Ironing Facilities, Free toiletries, DVD Player, CD Player, Toilet, Bathroom, Slippers, Cable Channels, Bath or Shower, Flat-screen TV, Hardwood/Parquet floors, Wake-up service, Alarm clock, iPod dock, Wardrobe/Closet, Bidet, Blu-ray player, Coffee machine, Towels, Linen, Toilet paper, Sofa bed, Pool towels, Bottle of water, Chocolate or cookies, Trash cans, Children's cots/cribs, Toothbrush, Shampoo, Conditioner, Body soap, Shower cap. Wake up to a breathtaking view of the lagoon, brushing through the lush vegetation at beach pool villa. An intimate, private villa, one can experience the finest and truest tropical Maldives at the studio. Inhale the fresh air in your private sundeck overlooking the infinity pool leading to the beach. Indoor bright and spacious, the studio features a master bedroom with king size bed, open air bathroom with open-air showers, bathtubs. Minibar, Shower, Bath, Safety Deposit Box, TV, Telephone, Air conditioning, Hairdryer, Iron, Balcony, Bathrobe, Desk, Ironing Facilities, Free toiletries, DVD Player, CD Player, Toilet, Bathroom, Slippers, Cable Channels, Bath or Shower, Flat-screen TV, Hardwood/Parquet floors, Wake-up service, Alarm clock, iPod dock, Private pool, Wardrobe/Closet, Bidet, Blu-ray player, Coffee machine, Towels, Linen, Toilet paper, Sofa bed, Pool towels, Bottle of water, Chocolate or cookies, Trash cans, Children's cots/cribs, Toothbrush, Shampoo, Conditioner, Body soap, Shower cap. Relax and unwind in the suspended water pool villa. With undistributed view of endless ocean lapsing with your studio, fresh cool breeze kissing your fresh, guests are in for a heavenly experience. 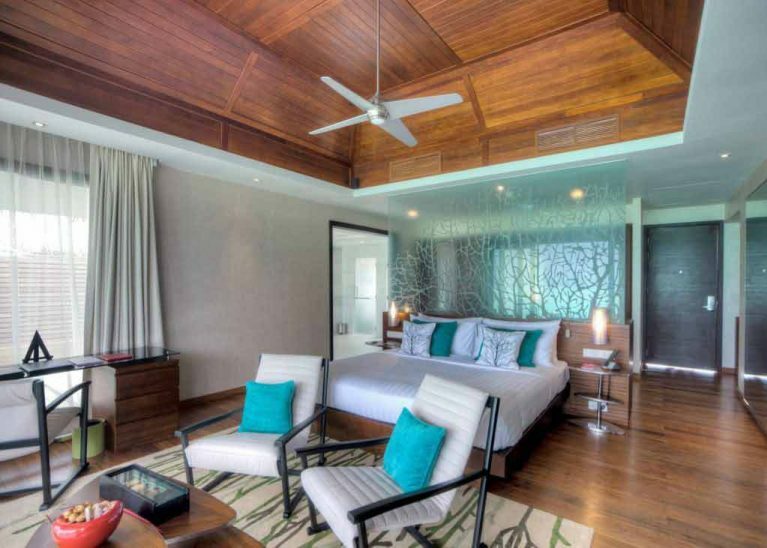 Swim in the infinity pool, relax in daybeds to sweeping views or head straight to lagoon at water pool villa. Indoor, the chic studio comprises of a master bedroom with king size bed, en-suite bathroom with partially open-air shower. Minibar, Shower, Bath, Safety Deposit Box, TV, Telephone, Air conditioning, Hairdryer, Iron, Balcony, Bathrobe, Desk, Ironing Facilities, Free toiletries, DVD Player, CD Player, Toilet, Bathroom, Slippers, Cable Channels, Bath or Shower, Flat-screen TV, Hardwood/Parquet floors, Wake-up service, Alarm clock, iPod dock, Private pool, Wardrobe/Closet, Bidet, Sea view, Blu-ray player, Coffee machine, Towels, Linen, Toilet paper, Sofa bed, Pool towels, Bottle of water, Chocolate or cookies, Trash cans, Children's cots/cribs, Toothbrush, Shampoo, Conditioner, Body soap, Shower cap. Thatched roof over water villa, Deluxe water pool villa is spacious and chic. A perfect place to relax, bask in the sun overlooking breathtaking vistas of island or swim in the infinity pool or enjoy an intimate Jacuzzi with fresh breeze blowing, or head straight to turquoise lagoon and feel the warm water. Indoor, a chic and contemporary studio comprising a master bedroom with king size bed, bathroom with bathtubs, open air rain shower awaits its guests. Wake up to the sweeping vistas of Blue Ocean clearing through lush foliage, at the extra spacious, Family Beach pool villas. Designed for families and friends, the villa comprises of a master bedroom with king size bed, living area with sofa and entertainment set and open air bathroom with indoor and outdoor rain showers. Head outdoor to a spacious deck featuring a private plunge pool, daybeds, loungers, dhoni swing where one can relax and enjoy stunning view of sunset. Minibar, Shower, Bath, Safety Deposit Box, TV, Telephone, Air conditioning, Hairdryer, Iron, Balcony, Bathrobe, Desk, Ironing Facilities, Seating Area, Free toiletries, DVD Player, Toilet, Bathroom, Slippers, Cable Channels, Bath or Shower, Flat-screen TV, Sofa, Hardwood/Parquet floors, Wake-up service, Alarm clock, iPod dock, Private pool, Wardrobe/Closet, Bidet, Blu-ray player, Coffee machine, Towels, Linen, Toilet paper, Sofa bed, Pool towels, Bottle of water, Chocolate or cookies, Trash cans, Children's cots/cribs, Toothbrush, Shampoo, Conditioner, Body soap, Shower cap. One Bedroom Beach Pool Pavilion Nestled amidst the lush vegetation of island and palm fringed beach, one bedroom beach Pool pavilion is a decadent and soothing experience. The spacious villa leading to beach comprises of master bedroom with king size bed, living area with sofa and entertainment set and open air bathroom with indoor and outdoor rain showers. Outdoor, relax and unwind in complete privacy and comfort featuring daybeds , swings, loungers, dining table and a private plunge pool. One Bedroom Water Pool Pavilion – An indulgent experience to privacy and comfort awaits at one bedroom water pool pavilion. An over water luxury suite, retreat back to the comforts of king size bed wrapped in finest linen or head out and soak in the sun. A extra spacious deck overlooking the stunning ocean comprises of an infinity pool, daybeds, loungers and Jacuzzi. With a staircase leading to turquoise lagoon head into escapism and befriend colorful fishes beneath your villa. Minibar, Shower, Bath, Safety Deposit Box, TV, Telephone, Air conditioning, Hairdryer, Iron, Balcony, Bathrobe, Desk, Ironing Facilities, Seating Area, Free toiletries, DVD Player, Toilet, Video Games, Bathroom, Slippers, Cable Channels, Bath or Shower, Flat-screen TV, Sofa, Hardwood/Parquet floors, Wake-up service, Alarm clock, iPod dock, Private pool, Wardrobe/Closet, Bidet, iPad, Sea view, Blu-ray player, Coffee machine, Towels, Linen, Toilet paper, Sofa bed, Pool towels, Bottle of water, Chocolate or cookies, Trash cans, Children's cots/cribs, Toothbrush, Shampoo, Conditioner, Body soap, Shower cap. Two Bedroom Beach Pool Pavilion – An expanse beach front villa, enter into escapism with serene beaches and ocean at two bedroom beach pool pavilion. A decadent and pleasing experience into a jungle comprising two king bedrooms, sunken living room with entertainment set and sofa, enclosed bathrooms with indoor and outdoor shower and a deck leading to ocean. The spacious deck features floating loungers, daybed, private pool and dining table. Minibar, Shower, Bath, Safety Deposit Box, TV, Telephone, Air conditioning, Hairdryer, Iron, Kitchenette, Balcony, Bathrobe, Refrigerator, Desk, Ironing Facilities, Seating Area, Free toiletries, DVD Player, Toilet, Video Games, Bathroom, Slippers, Cable Channels, Bath or Shower, Flat-screen TV, Sofa, Hardwood/Parquet floors, Wake-up service, Alarm clock, Dining area, iPod dock, Kitchenware, Private pool, Wardrobe/Closet, Bidet, iPad, Additional bathroom, Blu-ray player, Coffee machine, Towels, Linen, Toilet paper, Sofa bed, Pool towels, Bottle of water, Chocolate or cookies, Trash cans, Game console - PS4, Children's cots/cribs, Toothbrush, Shampoo, Conditioner, Body soap, Shower cap. Two Bedroom Ocean Pool Pavilion – Perched over turquoise lagoon, two bedroom ocean pool pavilion is an ultimate chic and contemporary villa for families and friends. Spacious and airy, the pavilion comprises of two king bedrooms, sunken living room with entertainment set and sofa, enclosed bathrooms with indoor and outdoor shower and a deck leading to ocean. Minibar, Shower, Bath, Safety Deposit Box, TV, Telephone, Air conditioning, Hairdryer, Iron, Kitchenette, Balcony, Bathrobe, Refrigerator, Desk, Ironing Facilities, Seating Area, Free toiletries, DVD Player, Toilet, Video Games, Bathroom, Slippers, Cable Channels, Bath or Shower, Flat-screen TV, Sofa, Hardwood/Parquet floors, Wake-up service, Alarm clock, Dining area, iPod dock, Kitchenware, Private pool, Wardrobe/Closet, Bidet, iPad, Sea view, Additional bathroom, Blu-ray player, Coffee machine, Towels, Linen, Toilet paper, Sofa bed, Pool towels, Bottle of water, Chocolate or cookies, Trash cans, Game console - PS4, Children's cots/cribs, Toothbrush, Shampoo, Conditioner, Body soap, Shower cap. BLU Enjoy family-style beachfront dining by the pool from day to night. Blu offers Mediterranean style cuisine. Dine by the pool with sweet ice cream or indulge to Asian delights with fresh flavor. EGDE Dine over the ocean in this stunning restaurant accessible only by boat. Indulge your taste buds on the tempting seafood and modern cuisine with local flavors. Complement the dish with signature cocktails. TRIBAL An inventive campfire dining experience with a fusion of African, central and South America with tribal flavors. Drink on coffee which are roasted on site or relish the taste of signature dish like big Afrikaner. EPICURE Start your morning in this restaurant with pastries followed by fruit salad and tropical drinks. Enjoy an a la carte menu with delicious flavors. Epicure offers casual poolside snacks, tribal grill campfires, and private dining. Choose from an array of signature wines. SUBSIX Plunge yourself in the bizarre beauty of this underwater restaurant. Relish the taste of Italian cuisine with music. Themed evenings and club nights bring out a new experience at this restaurant and bar. FAHRENHEIT Enjoy the laid back setting of this bar with spectacular views of ocean. Enjoy a special cocktail with music. Move your body in this vibrant bar or relax in the cozy couch. DUNE Dine at the beachfront with creative deli-style beach snacks, fresh pizzas, gourmet burgers and sandwiches and desserts. Quench your thirst with cocktails as you feel the sand at your feet. THE DELI Sip on a smoothie or coffee you are sure to enjoy here. The restaurant uses fresh fruits as you select from pastries, Panini or any other eating delights. NEST Nest offers East Asian cuisine in the most spectacular setting. The Teppanyaki restaurant offers great meals with contemporary flavors. Taste the world’s most expensive coffee, Black Ivory. Relish on Nest’s signature dessert: Luwak Coffee Brulee.